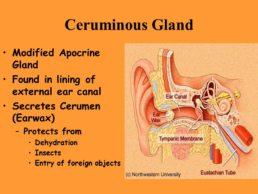 Earwax (or cerumen) is a secretion from the ceruminous glands in the outer ear canal. It is usually yellowish-brown in color, and has a waxy feel to it. Why do ears have earwax? Lower jaw movements, such as speaking or chewing, move earwax towards the outer ear canal. This continuous motion helps to cleanse the ear and push out excess earwax. Use a warm, soft cloth to remove earwax at the outer ear. Use drops of warmed olive oil, almond oil, water, or a commercial solution to remove larger amounts of earwax. Try irrigating the ear and gently rinsing it out with water. Likewise, hearing care professionals recommend that you DO NOT use ear candles to remove earwax, as they have not been proven effective and could potentially cause serious injury. 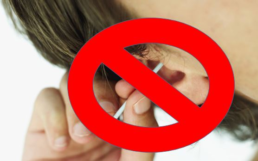 And most importantly, DO NOT use cotton swabs (or any other objects like bobby pins or lolly pop sticks) to remove earwax. These have been known to cause eardrum perforations and/or earwax impaction, as the swabs push earwax further into the ear canal. According to UpToDate online, “Excessive or impacted cerumen [earwax] is present in approximately 1 in 10 children, 1 in 20 adults, and 1 in 3 older adults.” You should see a hearing care professional when your earwax builds up in your ears and becomes too hard to wash away naturally. Your hearing care professional will examine your ears, determine the cause, and recommend treatment for earwax removal. Treatment options may include prescribing ear drops, applying wax-dissolving agents, using a suction technique, or providing another appropriate solution. Earwax is considered impacted when it has built up in the ear canal to the point where you become symptomatic. What causes earwax buildup and blockage? Some people just produce a lot of earwax, and over time they have a buildup that needs to be removed before the earwax becomes impacted. For others, the use of hearing aids, wearing earplugs, and using cotton swabs may impact earwax. Whatever the cause, you should seek treatment from a hearing care professional. How can I tell if I have impacted earwax? If earwax buildup is left untreated, you may develop a blockage (earwax impaction) that may result in temporary hearing loss or ear irritation. Other symptoms of earwax impaction may include pain (earache), ringing in the ear (Tinnitus), itching, foul odor, discharge, dizziness, and a feeling of fullness in the ear. If you suspect you may have issues with earwax buildup or impaction, contact at (661) 259-2500 for an evaluation and treatment recommendations.